According to a medium-growth scenario, it is projected that children under 6 will represent 6.0% of the population in 2035 – down from 6.5% in 2016. According to a high-growth scenario, it is projected that children under 6 will represent 6.7% of the population in 2035 – up from 6.5% in 2016. 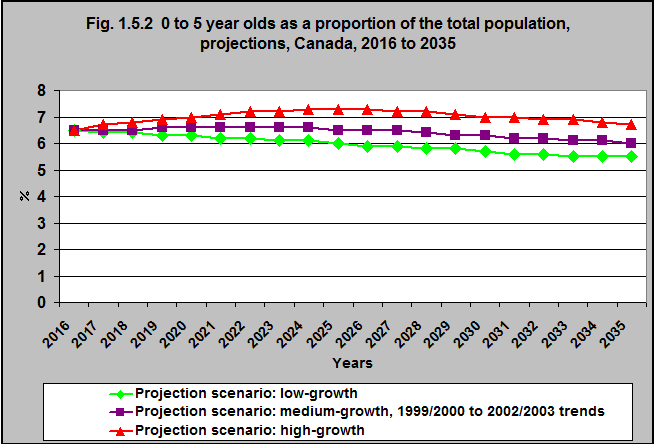 According to a low-growth scenario, it is projected that children under 6 will represent 5.5% of the total population in 2035, down from 6.5% in 2016. In spite of the increasing life expectancy, and increasing numbers of older Canadians, children under 6 will continue to represent a significant proportion of the population in future years. Therefore, they will continue to require policies and programs that support their well-being and healthy development.